Wow, talk about a foreshadowing episode for the upcoming new season of Spice and Wolf. For a “re-introduction” OVA, this short ~22 minute clip is very well made. Not only did it manage to include a fairly detailed introduction to the main characters of the series, but it also let us experience once again the life as a merchant through the usual exchange of dialogues between the characters. One of the first thing most of us who have seen the first season will be concerned about is the animation. If you still don’t know, this OVA and the upcoming season of Spice and Wolf is produced by Brains Base as oppose to IMAGIN which did the first season. For the most part, one can safely say Brains Base did a great job in taking over the series. While there are obviously some dissimilarities, especially with regards to Horo, overall you should not have trouble getting use to it. Another concern you may have is with the plot. Will it jump to a random timeline and ignore all the major events that took place in the first season or will it continue precisely from where season one left off? Thankfully it is the latter case … but with a twist. Although it is certain that the unusual merchant adventures will continue for our stars, this OVA (aka chapter 0) gives us plenty of clues that inter-character relations will play a much more significant role in the future. Given how much the pair of protagonists has gone through in the first season already, it should not be strange for the story to steer toward that direction for a change. Character-wise, as stated earlier, viewers have a brief but valuable first glimpse at our protagonists in this short OVA. Unlike the first season where everything is carried through dialogues, this time we see more “inner” character development (I call it “self realization”) via dreams or flashbacks. This new approach to reintroduce the characters is great in many ways. First off, it will not scare away new viewers with all the wordy exchange of dialogues. Secondly, it is also much more effective in reminding old viewers what type of characters they are and what their current mindset is like, thus preparing us for the upcoming new season. If there is one thing worth complaining about, it is probably with the sudden outburst of the “hidden” feelings between our protagonists. In particular, Horo’s reaction toward Lawrence became extremely evident and her jealousy is also highly entertaining. Other than the three major factors mentioned above, everything else remain largely the same as the previous season, that includes the music, seiyu roles, et cetera. Fans who wish to see more Horo x Lawrence romance relations will certainly be happy with the OVA. Overall, this is a wonderfully made OVA that serves its purpose well to lead us to the new (and hopefully better) second season. Good old Wolf. That's what I want to say but sadly I can't. It is apple-loving Wolf but somewhat looks slightly different and acts slightly different. That's not the same Wolf you used to play and travel with through fantasy medieval world of economy and politics. It's no longer the same but you're still going to love it. Story for this OVA is pretty simple. Shortly: we got to see Lawrence nursing Horo who got ill of fatigue caused by harsh events from previous season. Of course everything with addition of their usual quarrels, teasing each other, humor and curtness of our Wolf Sage. But this is not all. 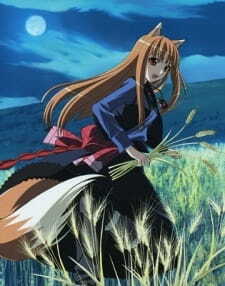 In fever Horo is dreaming about her past, her homeland and also about Lawrence and traveling with him. Seeing her dreams gives a short but meaningful glimpse at her feelings. As easily to predict considering studio change animation and also character design is slightly different from the first season. At first glance looks like Brains Base tried to keep this OVA similar to the previous season but of course it's not possible. Differences like "camera work" or characters appearance might not be very significant but still easy to notice. Personally I prefer work done by studio IMAGIN. But there is also a good information. Music remained the same as in first season which helps to maintain its unique climate. As for characters their semblance isn't the only thing which changed. Watching this OVA I've been feeling that sometimes they act out of character. Lawrence wasn't his usual self and Horo was oversensitive. Producing sequel to a successful series with a different studio and staff is a bad idea. It usually results in either inferior series or a total failure with Minami-ke as example. Luckily Ookami to Koshinryou II OVA is only just inferior but still acceptable and enjoyable. As a huge fan of Wolf and Spice I can't help but feel a little bit disappointed with those unnecessary changes but on the other hand relived that it's not as bad as it could be. Everything that makes Holo the Wise Wolf one of the most beloved characters in anime is condensed into a 23 minute window. Holo gets jealous, wasted, makes lots of cute faces, makes lots of sad faces, and mixes her immense wisdom with snark in a charming manner signature to her personality.This is exactly what you look for in OVA content - a reminder of why we love the characters and putting them into more intimate situations than in the regular anime. Even if you've never seen the regular anime, and especially if you have, this is a must watch. The complete collection blu ray contains both seasons and this OVA for ~30 somehow, a price so affordable you'd think Lawrence bargained for it. A departure from the TV series. This time around, it focuses on Horo's tsundere dere side to Laurence. However, it doesn't mean that it doesn't have the educational theme of the TV series. We all know how much we love the medieval economics knowledge *sarcasm*. Animation quality was almost unchanged from the TV series considering that this is an OVA. It's still Spice and Wolf. It was an enjoyable watch so I gave it a good rating.